Georgia, formally of USSR fame and 9th place winner in the 2010 Oslo Eurovision song contest! And it certainly has that vibe about it. 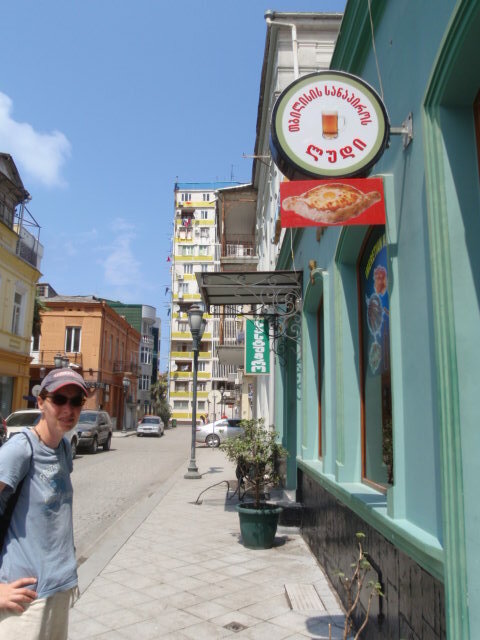 The first major city we landed in, as we ambled over a most haphazard and rambling border crossing from Turkey, was Batumi ‘the administrative centre of Adjara Autonomous Republic’. A delightful little coastal town run through with colourful cobbled streets; slanty buildings melt in the midday heat, cascading green foliage and dancing with chimeras, mermaids, atlantes and other mythical creatures. We liked Batumi. So, apparently, did Chris de Burgh. He was playing a gig there … everyone knew, everyone seemed to be under the impression we might know him! 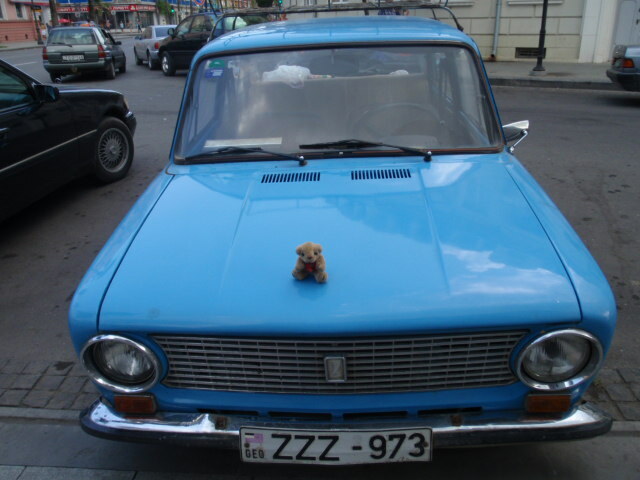 The next most super thing in Georgia are the ladas. These iconic little ex-soviet bloc tin matchboxes are the staple car in Georgia. They seem immune to the bullish driving tendencies of the Georgians; indeed their ‘cool’ factor seems to increase with every scratch and dent. And if we thought cycling on Turkish roads was dodgy it hasn’t a patch on the bedlam that is Georgian roads. Cars weave erratically from lane to lane then break in aggressive full stops as they need – impervious to the other traffic; they over-take on the blindest of bends – usually three a breast; hanging out of their vehicles they enthusiastically swerve over to greet us, almost running us off the road in the process. Part of me revels in the lackadaisical nature of it, it becomes easy to scoff at our ‘nanny state’ mentality – until you see the charred remains of burnt out vehicles, or come across the entwined corpse of a truck and lada in flattened embrace – no one walked away from that one. At the moment we find ourselves washed up in Tbilisi – a quite different place to the rest of Georgia, with its European aspirations and burgeoning self confidence. Begging is much more aggressive and apparent here than Turkey – we wonder if it’s a Christian / Muslim difference but are unsure. And Tbilisi seems to have replaced much of its ex-soviet bloc memorabilia with shinning new statues of St George and the like – overall it feels like a place where something has been both lost and found.